Discussion in 'Downhill & Freeride' started by Diablo_Freeride, May 5, 2008. U.S. Open of Mountain Biking event organizers announced today that a new unique photography discipline has been added to the event roster for 2008. In addition to the donwhill and dual slalom disciplines, a RedBull Sharpshooters event will compliment the U.S. Open action simultaneously. Photographers from across the globe will be capturing the energy and spirit of the U.S Open and competing for a high-end, all expenses paid trip (including photo credentials) to RedBull Rage, a progressive freeride competition in Virgin, Utah! 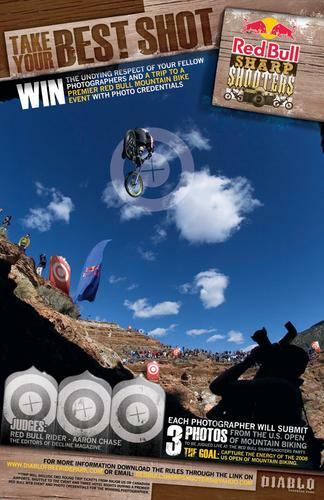 Photographs from the event will be judged live at the official RedBull SharpShooters party and athletes and riders alike are encouraged to attend what promises to be a memorable occasion. The 2008 U.S. Open of Mountain Biking presented by Freelap USA will take place May 23-25th at Diablo Freeride Park in Vernon, New Jersey. Over 400 athletes from across the globe are already registered for this prestigious event and event organizers have confirmed Sam Hill, Brendan Fairclough, Matti Lehikoinen, Kyle Strait, Kathy Pruitt, among many other top athletes will be in attendance. Quick Question though, this this Include the Qualifier's or the Actual Race on Sunday? Pro or AM, or both? Dang, i guess i'm OUT then! you get that when yo go there. Obviously but that doesn't answer my question... are we supposed to get any more registration emails before the open?? well what is it that you want to know? I feel I am not being updated on the open to much via email. Is that it with the emails and such? Do we just show up at this point? I am just wondering if there is anything else we need to know before the race. Ah yes, it is all in the details. Forgot to spell check the press release. Damn fat fingers, little keyboards. You should be able to get all the info you need on the website. Just show up and go to registration to get your number and lift tickets, and ride when you are allowed on the track. thats it. wooo my buddy Robert won the contest, and he's getting flown out to Utah to the rampage! Who enjoyed my bar hump picture?